The characters of series Regular Show are back in this game. This time they have a new fascinating adventure. The fate has brought them into the desert island full of dangers. Help them to escape. You have to run as fast as you can, avoid obstacles and attack enemies. Good Luck! 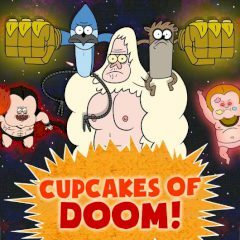 Games Similar Cupcakes of Doom!